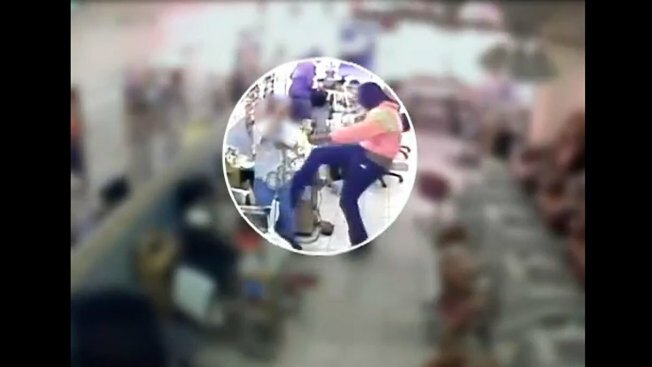 Two armed men were captured on video holding up a Prince George’s County nail salon, and one robber was shown kicking a worker and hitting her with his gun. The masked men entered a District Heights nail salon in the 5400 block of Marlboro Pike around 6:30 p.m. Sept. 23. The two men pulled their guns on the employees and customers, demanding cash and purses, said Prince George's County Police. One of the men struck a woman in the head with his gun after trying to go through her pockets. The video shows her complying. The man pulled something from her pocket before kicking her in the thigh and sending her falling to the ground. One suspect had long hair and wore a bright pink windbreaker, black pants and dark shoes. The other wore a black hoodie, jeans and dark sneakers. If you have information about the men, call Crime Solvers at 1-866-411-TIPS. You may also text "PGPD" and your tip to CRIMES (274637) or submit a tip online at www.pgcrimesolvers.com.